"Kit Woolsey and Hal Heinrich have assembled a collection of problems that tests the ability of even the best human players, yet provides instructive lessons for everyone from beginner to expert. All the positions in the book are taken from actual tournament matches in which a top expert made an incorrect choice. Only those problems which were able to stump most on a panel of eight experts were included in the book. In each case, the correct play has been verified by an elaborate series of computer analyses using the neural net Jellyfish. "After elaborate screening, including submitting several hundred plays to a panel of experts, Hal and Kit collected the 104 problems treated in their new book. The format is simple, with all the best features of a problem book. Each position is pictured as Kit devotes a page or two to describing the candidate plays. The problems are tough. Kit's approach has always been to explain the thought process that allows you to arrive at the correct answer, building argument upon argument until he has constructed a solid case. This time, he has to look at Jellyfish's answer and find ways of dismissing the alternate plays until only Jelly's choice remains. COVER: New Ideas In Backgammon is the first collection of backgammon problems that has been extensively verified using computer analysis. Assisted by the neural network technology of the world's top backgammon program, Jellyfish, Kit Woolsey has assembled a collection that tests the ability of even the best human players. Each of the 104 problems is taken from an actual tournament match in which a world-class player made a serious error. Woolsey explains the positions in lucid terms, points out the expert's error, and shows what play should have been made. 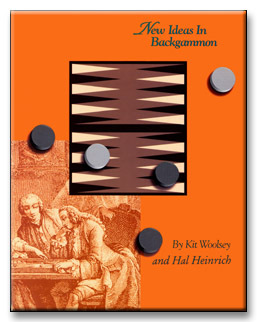 New Ideas In Backgammon is a groundbreaking work that is certain to improve the play of every reader, from beginner to grandmaster. AUTHORS: Kit Woolsey has long been recognized as one of the world's top backgammon players, commentators, and authors. Among his many backgammon victories was first prize in the Reno Master's Tournament in 1988. He is the author of four other books published by the Gammon Press, including the best-selling How to Play Tournament Backgammon. He's also a world-class bridge player, the winner of several national and world championships. Hal Heinrich is Canada's top backgammon player and has been considered one of the world's best for nearly a decade. He won the Monte Carlo World Championship in 1990. His other major tournament results include a second-place finish in World Cup III (1992) and first places in the Las Vegas Masters Tournament of 1993 and the Las Vegas Open of 1994. He has worked as a computer consultant in Calgary for the last 15 years, and actively maintains the world's largest database of recorded matches.